Desiree B. Antarctica, originally uploaded by Desiree B. 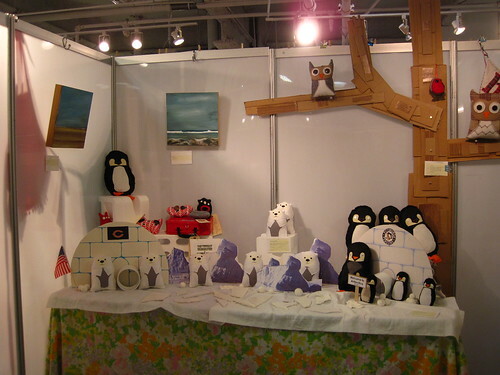 Here's a snap of my booth featuring the antarctica scene and owl tree. 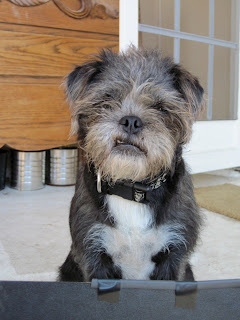 I also recently stumbled across these Uplifting tales of Success and thought I'd post the link if anyone fancies some motivation. Pardon the pun but I've been trying to think of catchier blog titles. After an action packed Easter weekend, it has dawned on me that I have 2 weeks left till UNIQUE LA. Maybe I'm panicking prematurely but it seems that not a minute goes by without a needle in my hand. Of late I have become obsessed with felted flowers and if I continue at the current rate of output will have a veritable garden of brooches and hairclips. In my quest for more colours I stumbled upon the holy grail of wool, a ginormous Ralph Lauren black woolen cape, several yards of smooth fabric. The possibilities are numerous, it can be used for the penguins as well as many flower brooches. There was also a nice XXL cashmere jumper that got the hot water treatment, I love the feel of cashmere so soft and what luck finding the largest size! My husband voluntarily came with me and held my bag while I rummaged through, he had no desire to try to differentiate between acrylic and wool. Still I felt pressured into speeding my usually leisurely pace which probably wasn't a bad thing as I managed to get a load of washing done when we got home. Daffodils and improvised vase. I did have a fancier one I just preferred this one more. My sweet windswept nieces and their custom flower headbands.